When the Scot took up the reins last July, he saw it as an opportunity to repair the damage wrought by a brief but bruising spell as Manchester United boss, during which he felt he was treated unfairly, and an ill-fated sortie into Spanish football with Real Sociedad. Having lasted only 10 months at Old Trafford, where Sir Alex Ferguson's shoes proved simply too sizeable to fill, and barely a year in the Basque country, Moyes intended to do for Sunderland what he had done for Everton during an 11-year tenure which saw the club transformed from perennial strugglers to top-eight regulars. The Black Cats were still patting themselves on the back after a fourth successive escape from relegation when his predecessor Sam Allardyce was handed - albeit spectacularly briefly - his dream job as England manager. Owner Ellis Short thought he had found a like-for-like replacement in Moyes, a man who he revealed had been his "number one managerial target for the last five appointments". Short said: "The fact that David has committed to a four-year deal is a clear demonstration of his belief in what he can achieve here. "It is our aim to become a better, stronger and more stable football club and, with a manager of David's calibre and experience at the helm, we have a fantastic opportunity to begin looking upwards, rather than downwards every season." His mission was to bring an end to the club's seemingly constant flirtation with the drop and establish them in safer waters, and it was one which was always going to take time. Hopefully I'm here for four years and I'll try to bring a level of stability to the club. Everton had been in the bottom six, I think, four out of the five years before I came in. Hopefully we can do a bit of an Everton." What they did was a bit of a Sunderland. There were those who believed Moyes was out of his depth at Manchester United, where the support he expected in the transfer market failed to materialise as Champions League and even Europa League football ultimately eluded him. Life was little easier for him in Spain, and it seemed a good fit when he accepted Short's offer of employment and the reduced expectation it carried with it. But as the summer transfer window closed without the arrivals for which he had hoped, he realised very quickly that he might have his work cut out. 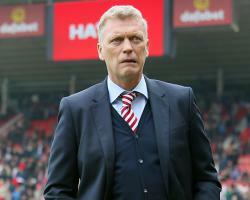 Speaking after a 2-1 home defeat by promoted derby rivals Middlesbrough in just the second game of the league campaign, Moyes offered a bleak assessment of what was likely to lie ahead. It can't dramatically change - it can't." Slammed as defeatist in some quarters, Moyes' comments proved to be brutally accurate with the club's parlous financial situation, details of which were made public in December, having done little to lift the pall hanging over it. The Scot, who admitted he might have had second thoughts had he known the full extent of the financial situation, tried to make the best of a bad job, although has struggled to hide his emotions - at one point suggesting he might "slap" a female reporter. Relegation was confirmed last month - but supporters at the Stadium of Light were calling for the Scot to leave long before his departure was confirmed.